God is not unknown to the world. Many know very well that God “is.” But not many of these know “what” God is. Knowing that God “is” leads to some service to Him. Knowing “what” God is leads to more generous service to him. In some, even, it has led to high sanctity! That is why Jesus, God Himself, united himself to one human nature, became man to show other humans “what” God is! Not content with using his own humanity to reveal “what” God is, He chooses numberless other human natures — people — to continue revealing Himself. So, with long living, little by little, we come to know better “what” He is! Through other humans! Jesus working in and through them! First and most of all, it is through Jesus’ own humanity that we learn “what” God is; but also, and very importantly, Jesus works through other human natures, revealing Himself through them! Among these other people Jesus frequently chooses the inferior, the disliked, the rejected, and the despised — the sinners. The Samaritan woman of today’s gospel is one of these. Being a Samaritan, she held and followed a false religion, detested by the Jews. She was an outcast! Jews would not even use utensils (like the bucket at the well) which she had used — much less talk with her! “Everything,” including those five husbands and her present “live-in.” “Everything,” because Jesus wanted to show her how much He knew of her — the messy moral mix-up of her life. Could He be her long-awaited Messiah? He really attracted her! The seed of faith was planted! Jesus revealing, through other humans, “what” he is! — Rev. Virgil Caskey, C.Ss.R. Father Caskey professed vows as a Redemptorist in 1939 and was ordained to the priesthood in 1944. 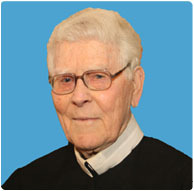 He is the oldest and longest-professed member of the Baltimore Province.